It is replaced by the Zebra iMZ220. 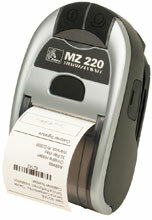 Get the benefits and value associated with Zebra with the MZ 220 economical receipt printer. Each 2" width MZ 220 printer can be a smart assistant for any mobile receipt printing application where you need quick, simple receipts on demand. Use 802.11g, Bluetooth, IrDA or USB to connect to a handheld or smart phone device and produce crisp, clear receipts! MZ220 802.11b/g US. This is the TAA compliant version of this product for government purchasers. Please Call for more information. MZ220 USB/IrDA/Bluetooth. This is the TAA compliant version of this product for government purchasers. Please Call for more information. 4MB/8MB, US/Canada English, 802.11b/g, US power plug. This is the TAA compliant version of printer (Part# M2E-0UK00010-00) for government purchasers. Please call for more information. Direct thermal, 203 dpi, 2" width, 3 ips, unlinered platen, 802.11g (Zebra Value Radio) interface. Includes battery and charger unit. 4MB/8MB, US/Canada English, Bluetooth, US power plug. This is the TAA compliant version of printer (Part# M2E-0UB00010-00) for government purchasers. Please call for more information. Direct thermal, 203 dpi, 2" width, 3 ips, unlinered platen, Bluetooth interface. Includes battery and charger unit. Direct thermal, 203 dpi, 2" width, 3 ips, unlinered platen, USB and IrDA interfaces. Includes battery and charger unit.